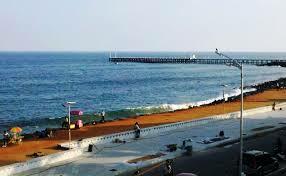 Pondicherry, or Puducherry is a coastal city bounded by the Tamil Nadu state of India. When it comes to exotic yet cheap romantic getaways in India, Pondicherry is an underdog, since not many know of the exquisite elements of this quaint little city. Pondicherry has never failed to steal the hearts of the tourists who rave about its serene beaches. For the newlyweds, or for the couples seeking solace from the chaos around, Pondicherry is a longshot. The beaches in and around Pondicherry have a poise of typical Indian coastal lifestyle with a French lustre. These golden sites are worth that romantic stroll by the seaside. Check these out. Plage Paradiso Beach – the locals’ and tourists’ favourite, the Plage Paradiso Beach is a vast 1.5 km long expanse of shimmering golden sands and azure blue waters of the sea. After a good sunbath, one can relax under the cool shelter of the palm trees that this beach is lined up with. The beach is majorly frequented by locals, and due to its breathtaking views, attracts tourists as well. Paradise Beach – this one’s a complete family entertainer. The Paradise Beach not only has a gorgeous shoreline, but also has a lot of options for entertainment, with water sports being the most sought after. Also, some of the finest hotels in pondicherry are located near this beach. Even better, know? Mahe Beach – not much explored and frequented by visitors, the Mahe Beach is the most exotic and virgin beach around Pondicherry. The palm tree fringed shoreline of the beach, with blue waters, and clean golden sand makes it a relaxing retreat. One may collect beautiful florid shells along the beach. Start with the sandcastles! Promenade Beach – head up for a peaceful stroll at the promenade along the seafront. A perfect outing for couples who are seeking some quality time with a surreal ambience. The best part of this place is that this area is motor-free from 6 in the evening till 7:30 in the morning, so that the mind and lungs get that much needed power boost. Auroville Beach: the most serene of all beaches, the Auroville beach is some minutes away from the main city of Pondicherry. The beach is a perfect setting to spend sit back and relax, with the sound of waves crashing, and the sunset to seduce the eyes! The city of Auroville is some 100 metres away from this spot and is a must visit place. Serenity Beach: as the name suggests, this beach is pretty secluded yet one can sit back, and relax while watching the waves crash on the stone lined shore. Go Air Airlines, Spicejet, Indigo, etc. have pretty economical deals in store for flyers these days. Keep a check on these sites and book that ticket to an exotic trip through the chic city of Pondicherry. Au revoir!